As a good business owner, you’re always looking for ways to cut down costs, whether it’s in the way you do business, or the spaces you use to operate. Unfortunately, when unexpected roofing damages come knocking at your door, your plans for saving money simply fly out the window. Or do they? 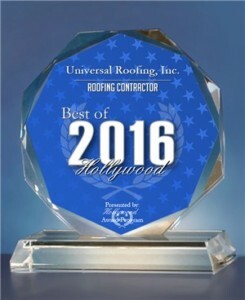 As the number one roofing services company in Broward County, FL, Universal Roofing is dedicated to giving business owners like you affordable options for any commercial roof services or commercial roof repairs. For over 35 years, we’ve made it our priority to take care of any roof we’re asked to service with the precision and technique. Consequently, no size roof is too big or too small for our exceptional quality of workmanship. What is more, we also offer services on every type of brand in the market, so that our goal of serving you no matter what is always maintained and practiced. Since opening our doors in 1980, our friendly staff of roofing experts have been the go-to contractors for all types of businesses and properties in Broward County, Florida. That’s because we’re known to get any roofing job done in a limited amount of time, and our quality of work always stays the same. We are proud of our A+ rating at the Better Business Bureau and encourage you to check our page, and the many reviews and testimonials our loyal customers have kindly written. Our excellent customer service coupled with our variety of commercial roofing services keeps our customers happy. We constantly exceed expectations and can’t wait to do the same for you and your roof. At Universal Roofing, we understand that you can never expect when an emergency repair needs to be done on your roof. That is why our licensed and insured professionals are always on standby, waiting to fix any roof at any given time. With ongoing training and many years of experience that you can trust, our contractors can easily diagnosis and make solutions for unforeseen damages from a storm, mold, or age. They can also work on your roof whether it is a metal roof, shingle roof, tile roof, or even a modified roofing system. So give us a call at 954-923-5100 when you need a repair done fast. When you know it’s time to replace your roof because of old age or damages incurred over time, there’s no other company that can offer you a variety of affordable roofing other than Universal Roofing. When you give us a call, we will work directly with you to figure out what is best, and stay within your budget so you can be sure you’re making the right choice. Our extensive experience in roofing gives us the ability to give you so many options while keeping your costs low. Furthermore, since no two building are alike, no two roofs are alike, and we aren’t afraid to get creative when it comes to planning and installing the perfect roof for your business. So let us help you make this important decision an easy one. Give us a call at 954-923-5100. When a natural disaster occurs or you know it’s time to invest in a new roof, the process can be quite stressful. At Universal Roofing, we make it our business to take the stress off your back and keep your money in your pocket. As a full service roofing company, we want to make sure your business and the people inside your buildings stay safe and comfortable. That is why we work so hard to repair roofs on time, and install a roof with the highest quality efficiency and work. Please don’t hesitate to give us a call at 954-923-5100 for more information and a free estimate!